Having just made sweet tart dough, the first recipe in the Sweet Tarts and Pies section of The Modern Baker, I obviously had to make something to go in it. 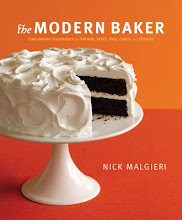 Looking through the book, this recipe immediately caught my eye. 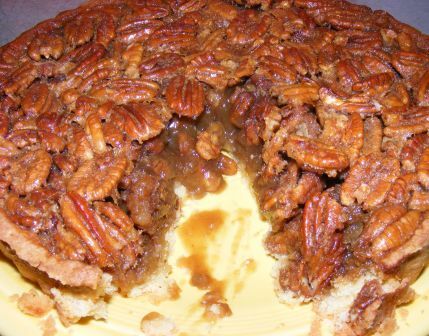 First of all because I love pecan pie and this recipe, with its hint of bourbon, sounded really good. Also, I knew I had almost all the ingredients I needed to make it. And the one I didn’t have? Well, it’s always nice to have an excuse to buy a bottle of Maker’s Mark, isn’t it? 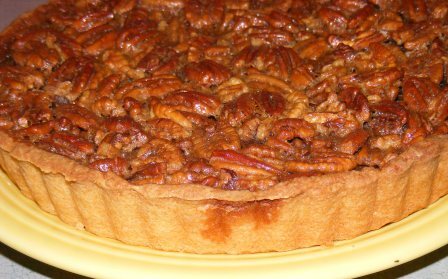 If you’ve never made a pecan pie or tart before, you’ll be surprised at how easy it is. 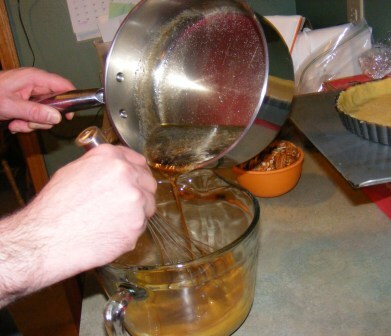 I began by heating dark corn syrup and sugar over medium heat. 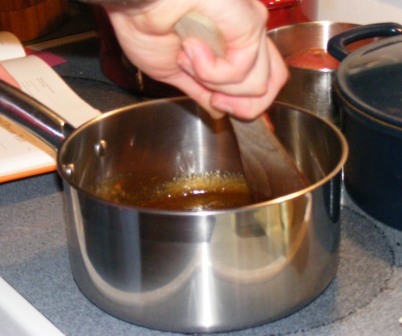 After the sugar mixture came to a boil, I took it off the heat and added butter and let it melt without stirring. 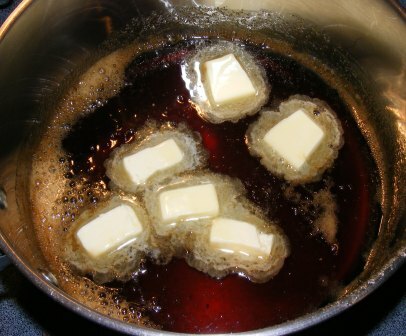 While the butter was melting, I whisked eggs, salt, and bourbon in a bowl, then I slowly whisked in the syrup. Nick cautions against overmixing at this point, which would cause the filling to be cloudy instead of clear. 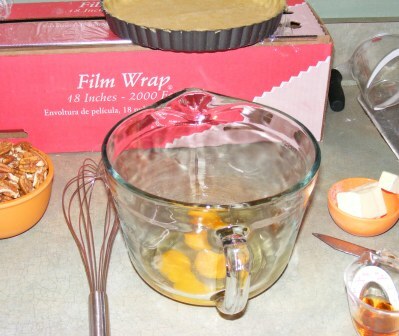 He also says to allow the mixture to sit for a few minutes, then skim off the foam. 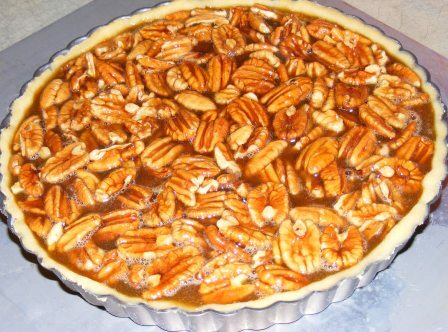 I did this, then stirred in the pecans and dumped the whole thing into the tart pan. If the filling resembles the proverbial 10 pounds of taters in a five-pound sack, it’s because I made a nine-inch tart crust (the recipe calls for an 11-inch pan) but didn’t scale back the filling. I thought I would have some filling left over, but I was able to squeeze it all in the pan without any overflow. I baked the tart in a 350°F oven for 35 minutes, until the filling was set and little bubbles were breaking on the surface. I took the tart out of the oven and allowed it to cool — more or less — in the pan. Oh, who am I kidding? As soon as that bad boy was cool enough to handle without burning myself, I got it out of the pan and onto a plate. And it wasn’t long after that until I was slicing into it for a taste. I wrecked that beautiful tart, and I didn’t care. I had to try it. And let me tell you, it was worth it. 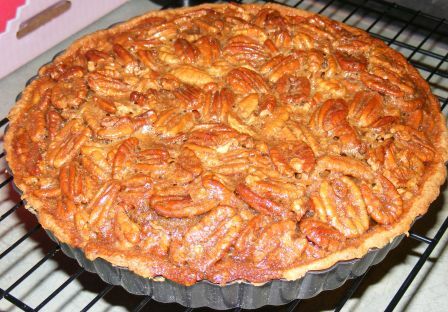 This was easily the best pecan tart/pie I have ever tasted. The filling was sweet, rich, and buttery. But what really set it apart was the bourbon. There is only a tablespoon-and-a-half of bourbon in the whole tart, and you might be tempted to skip it if you don’t drink bourbon or have any on hand. That would be a huge mistake. 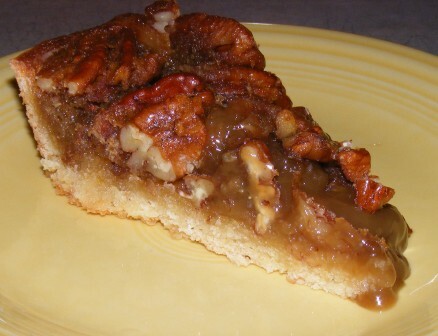 Without the bourbon, this would be just another delicious pecan tart. The bourbon — which is very subtle, more of a sense than a taste (I can see why Nick calls it “bourbon-scented”) — elevates this tart to a class of its own. It adds richness, depth, and an aroma that will keep you shoveling this rich tart in your mouth long after you’re full. Unless you have a strong aversion to bourbon and rich desserts, I guarantee you will love this recipe. But a word of caution: if you bring this tart to your next holiday meal, you’d better bring two. And you should probably plan on bringing it every year. Great photos…and Mark would love that explosion of nuts and filling you have in that 9″ pan…oh, yes, this is one of his favorites. I guess I will go out and score some liquor today. This looks fabulous! Thanks. I’m sure Mark will love it. You might just, too. Definitely worth a trip to the liquor store. Wow, your pictures are amazing! It really looks beautiful and delicious. I think it would be the perfect dessert for Thanksgiving – a nice change from pecan pie – but not so different that you’d miss the pie. I’m going to have to bookmark it and wait patiently. I simply can’t have that in my house unless I have a lot of people here to eat it. This will definitely replace pecan pie on our Thanksgiving table. But I can tell you, there’s no way I’m waiting until then to make this again! I’ve been very restrained. Other than the first day, I have limited myself to one piece per day. And I even shared it with my family. Love this post! And I agree…this tart was so so so good. Thanks. Writing it made me hungry. I think there’s one piece left, but not for long.